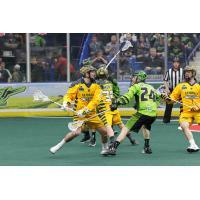 (SASKATOON) - The Georgia Swarm (9-7) won its fourth-straight game with a 16-10 win against the Saskatchewan Rush (13-4) on Saturday night in front of 14,745 fans. The Swarm jumped to a 6-3 lead at halftime in SaskTel Centre and never looked back to remain tied for first in the East Division. Lyle Thompson and Randy Staats combined for nine of the Swarm's goals, while the Swarm defense in front of goaltender Mike Poulin turned in a sensational performance against the top team in the West Division. Lyle continued his goal-scoring dominance with another five-goal game, his third in the past four games. "I thought we had a good game plan," Swarm head coach Ed Comeau said. "We played the style we want to play. Mike Poulin made some huge, huge saves when we broke down, and they had some good looks. Our entire defensive unit was good, and I thought our offense did a good job of getting off the floor, getting our D guys out there to do their job. All in all, a really solid team effort from front door right through the back door." Georgia and Saskatchewan wore special jerseys honoring the Humboldt Broncos. 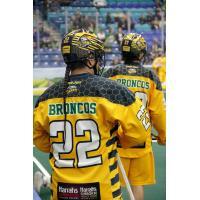 Georgia had "Broncos" in the name plate of its jerseys, while Saskatchewan wore "Humboldt" across its players' backs. Both teams wore Humboldt Broncos patches on the fronts of their jerseys. The teams are auctioning the jerseys at NLL.com/Humboldt, and all proceeds will be donated to the Humboldt community. The auction runs until April 21. Jeff Shattler broke the ice for Saskatchewan, scoring the Rush's first goal. It would be the team's only goal for 18:02 min. Staats scored his first of the night while the Swarm was man-up to tie things up. Shayne Jackson received a pass from Staats later on to net it on the crease, and Jordan Hall put enough momentum on the ball to get past the netminder. At the end of the first quarter, the Swarm was up 3-1, a lead it would not relinquish the entire game. The Swarm built upon its first quarter efforts with a goal from Lyle, as he used three Rush players as a screen to score his first of five goals on the night. Saskatchewan went on a quick two-goal run to bring the score within one goal before Lyle separated the gap with a shorthand goal. Kiel Matisz capped the first half with a jumping shot, and the Swarm headed for the locker room up 6-3. Georgia's scoring streak continued into the second half. Lyle kicked things off with his hat trick goal from near the center of the floor, one of the longest goals scored in Swarm history. Staats then scored back-to-back, one goal on the power play. Ryan Keenan managed to score on the power play, the Rush's first goal in 19:57 min. which simultaneously stopped the Swarm's five-goal storm. Team captain Jordan MacIntosh had the final word with an unassisted shorthand goal, putting the Swarm up 10-4. Staats scored his third power play and fourth goal of the night to break things open in the fourth quarter. Mark Matthews retaliated 35 seconds later with a shorthand goal before Lyle notched his fourth of the night. Robert Church scored with a catch-and-release, and Shattler followed suit with his second of the night, an unassisted goal. Matthews netted his second goal to put the Rush within four goals, but Lyle bested older brother Jeremy Thompson for his fifth goal of the night, 40th goal of the season. Hall widened the gap back to six goals off a feed from Jesse King before Mike Messenger scored immediately after winning the next faceoff. Keenan netted Saskatchewan's third power play goal of the night, but Jackson put the Swarm back up by five goals before MacIntosh capped things with an empty netter, his first game this season with multiple goals. The final buzzer sounded, and Georgia made its statement with a 16-10 win against Saskatchewan. Staats led the men in blue and yellow with a season-high eight points (4G, 4A). King followed up in points with six assists. Lyle's five goals led the Swarm in scoring, tying with Hall and Jackson in points with five (2G, 3A). The Swarm defense continued its streak of excellence. It helped Poulin make 39 saves to finish the night with a .800 SV%. Georgia's special teams performed well Saturday night, going 3-8 on power play opportunities (all from Staats), killing half of the Rush's man-up chances and scoring two shorthand goals. "I moved positions," Staats said about his success on the man-up. "I was on the shooter, and then I moved up top. I think just moving the ball fast and kind of taking that shot from up top really helped me. I think our power play clicked really well, and that goes to our team again and our offense as a whole moving the ball and kind of finding the open guy." Church (1G, 3A) and Matthews (2G, 2A) led the Rush in points with four apiece. Goaltender Evan Kirk spent 57:20 min. in front of the net, making 35 saves on 49 SOG. He finished the night with a 14.65 GAA and a .714 SV%. With the win, Georgia remains tied for first with the Rochester Knighthawks (9-7) in the East Division. "We told ourselves before this game this determines whether we're a playoff team or whether a championship team here," Lyle said. "Kind of getting back to the way we were feeling, the way we were playing last year. Overall, it was a really good performance, as a full offense, defense, goalie, everything." After a bye week, the Swarm's final home game of the 2017-18 season at Harrah's Cherokee Casino Field at Infinite Energy Arena is against the Vancouver Stealth on April 28 at 7:05 p.m. ET. With things as close as they are in the East Division, the first place Swarm will need to finish the season strong to make it to the postseason. "We got off to a slow start this year, and I think the boys are rallying back and getting back to having fun and sticking to our principles," Staats said. "That's huge for us. I think we were getting away from that a little bit earlier on, but now the boys know it's crunch time, and it's time to buckle down and get these wins, because the playoffs are still not a for-sure thing. We've got to keep working hard." Fan Appreciation Night is presented by Mitsubishi Electric Cooling & Heating, and early arriving fans will receive a Swarm Team Poster. Award-winning band Lifehouse will perform during halftime and postgame in the Atlanta Classic Cars Mercedes-Benz Goal Zone Club. Fans can get tickets at GeorgiaSwarm.com/Fan or by calling 844-4-GASWARM. He will be modest about it, but Lyle's hat trick goal stunned an entire arena and viewing audience. Finding himself just south of the "H" of the Rush mid-floor logo and with the seconds winding down on the shot clock, Lyle made a Hail Mary shot that surprised Kirk when it passed by him. "It was a lucky shot," Lyle insisted. "I would say, based on Evan Kirk's reaction, that he didn't see it," Comeau said. "He was screened by a defender and by someone else in the middle. It wasn't like it went into the middle of the net. A lot of heat on it and it was right on the pipes." Chuckling, "Those are the ones you don't usually get, and we said on the bench, 'Hey, we'll take that.'"